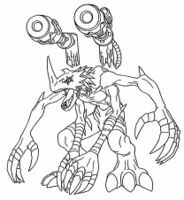 An Ultimate Composite Digimon that has fused the overwhelming power possessed by Mugendramon and the data of various powerful Digimon possessed by Chimairamon. It is said to be impossible to defeat, and at present the unclear cause of its fusion is being ascertained, but it is unlikely that any clues will be found. Its Special Move is creating a different dimension with compressed time, and it can keep an opponent in that subspace for an eternity (Time Unlimited). Title: 「千年魔獣」 — "Millennium Demon Beast"
Time Unlimited  タイムアンリミテッド Taimu Anrimiteddo Time Unlimited, Ultimate Fusion Summons a black orb that imprisons the enemy in a dimension where time is compressed. Detonates the spherical dimensions it creates, or fires an energy blast from its hands that electrocutes the opponent. Fires energy blasts or beams from its cannons. 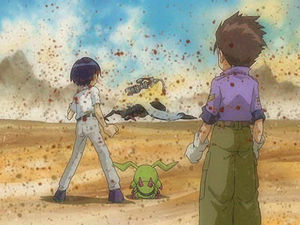 Millenniumon is seen in a flashback in which Ken pushes Ryo out of the way and is struck with the Dark Seed that was initially meant for Ryo. It is revealed in Brave Tamer that he is Ryo's true partner Digimon. Nene uses the Darkness Loader to combine many different digimon into both Mugendramon and Chimairamon before digixrosing the two into Millenniumon and unleashing it on Xros Heart. Because Millenniumon could endlessly regenerate, defeating it normally proved impossible, so Taiki and Kiriha opted to seal it outside the Zone in digital space. 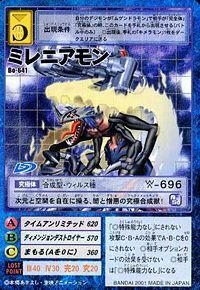 However, Millenniumon returns to attack Dark Knightmon before Nene Shademon forcefully digixrosed them into Zeed Millenniumon. 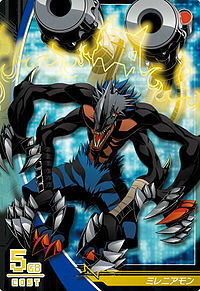 Millenniumon appears as the final boss in the game. 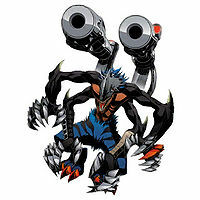 Millenniumon is #370 Digimon and is a Ultimate-level, Attacker-class, Dark-species with a resistance to the Dark element and weakness to the Light element. Its basic stats are 316 HP, 346 MP, 175 Attack, 138 Defense, 159 Spirit, 134 Speed, and 77 Aptitude. It possesses the Heroic Power, Dark Veil, Critical 4, and EX Damage 4 traits. 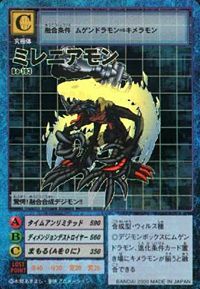 Millenniumon can Jogress from Chimairamon and Mugendramon, if the base Digimon is at least level 55, with 27,000 Dark experience, and 320 attack. Millenniumon can be hatched from the Millennia Digitama. 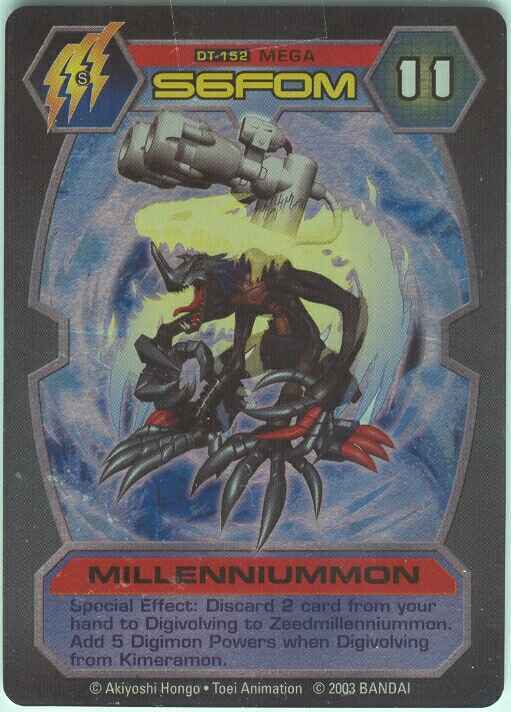 Millenniumon is only obtainable as a collectible card. Its card is part of the Millennium (ミレニアム Mireniamu) set. 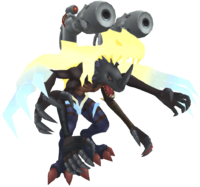 Millenniumon is available as a Digimon Medal. Terror! 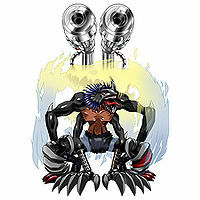 A composite Digimon formed from fusion!! The ultimate chimera formed from darkness and hatred, it is able to manipulate dimensions and space at will! 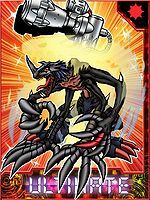 A fused Composite Digimon that crosses space-time, bringing ultimate destruction! 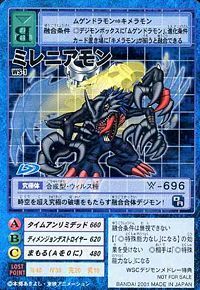 The ultimate Composite Digimon, formed from the fusion of the mechanical composite Mugendramon, and the organic composite Chimairamon. It is said that defeating it is impossible, due to its ability to control the flow of time. 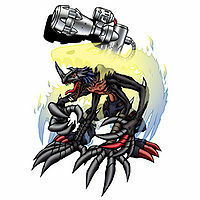 ↑ Digimon Xros Wars: "Xros Stars! Like a Falling Star!!" This page was last modified on 14 April 2019, at 22:34.